November 24, 2009 Dan O. Its official, Woody Allen can do no wrong!!! Tennis pro Chris (Jonathan Rhys-Meyers) gets mixed up with the darker side of high society in this suspenseful drama with a Hitchcockian flair from writer-director Woody Allen, who sets the action across the pond from his beloved New York City. Chris is befriended by a wealthy family and falls for femme fatale Nola (Scarlett Johansson). But a clandestine affair involving another woman leaves Chris wondering if murder is the only way out. Now this film for me raises about two big questions: 1. Does Woody Allen have anything left to say?, and 2. Does Scarlett Johansson have the acting chops to pull off all the roles she’s been getting. The answer to the first question is a resounding yes. For people that don’t like Woody Allen films well then you may just want to check this out. It is nothing like any of his other usual witty romantic comedies. 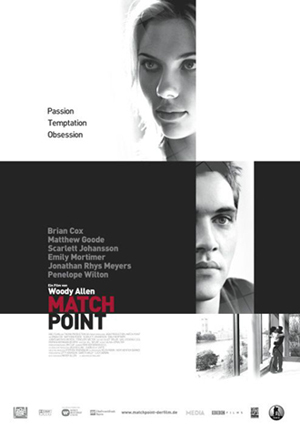 Match Point is romantic, very dramatic, and by the end turns into a type of psychological thriller. One thing I really loved about this film was that it’s main message about luck and its effect is shown incredibly well throughout the movie. The opening image stays with you during the film, and is shown again once more and even more touching and meaningful. The amazing story about infidelity and being caught up in lust really does keep you interested in this film. It is played out so well, as they show you how this one man interacts with both of these women on a daily basis and not once does one story become more interesting than the other. Every moment that happens in this film just keeps you more and more glued to the screen where you are ultimately in love with this story. Now to answer the second question that is also a resounding yes. Johansson does a great job as well as playing this chick who at first plays hard to get then by the end of the film she starts to really turn out to be one of these crazy obsessed chicks that your just afraid of seeing. Also, Rhys-Meyers basically does an even better job, but the only problem I had with him was that I just felt he was a little too gay looking. I mean check out pitcures of him, he doesn’t look like the kind of guy that would be banging Johansson on the side. But hey that’s just me. The ending to this film is ultimately effective and it feels very true. This story couldn’t have ended any other way other than the way it did. One of the more effective films I have seen ever from Allen, and overall probably ever. Consensus: Match Point is one of Woody Allen’s best that features great writing, a compelling story that teaches us the lessons about class and infidelity. I love how this film is a departure from Allen’s usual witty romantic comedies like you mentioned. While it is a more intense film, it’s refreshing at the same time to see him go in a new direction and be just as successful. yikes. Dan, a 9.5 for this? im very disappointed. having jonathan rhys meyers in any movie is enough to take at least six marks off. mind you, having Brian Cox in a movie (whichever one of the five it is he did that week) should guarantee at least five points. factor in scarlet ‘blank canvas’ johananananesnensnensen (this is the girl who once played a painting), however, and your mark should be way lower. Yes I know what you are saying Ross, but this film just really kept me interested all the way through.. Thanks for your opinion though, I always like to see different sides to one movie.